Every Saturday, I host a feature called Kid Konnection -- a regular weekend feature about anything related to children's books. This week, I'm going to share with you a book that's extremely timely since the Summer Olypics are only a few days away. Summary: Joey Jordan loves gymnastics: the thrill of performing a backflip on the beam, the cheers of the audience when she sticks a landing. But even with all her talent and style, she's never quite made it to that gold medal stand. 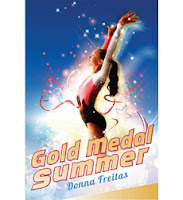 When GOLD MEDAL SUMMER by Donna Freitas arrived on my doorstep, I immediately had flashbacks to my childhood. I grew up loving to watch the Olympics and one of my absolute favorite sports was women's gymnastics. I had fond memories of watching Nadia and Mary Lou, and I can assure you that GOLD MEDAL SUMMER would have been a book that I would have devoured as a girl. As it happens to be, I enjoyed it quite a bit as a middle-aged mom too! I sat down late one night a few days after the U.S. Gymnastics Trials and picked up GOLD MEDAL SUMMER; and I didn't put it back down until I finished it. It is a middle grade book so it's not especially long -- it comes in at about 230 pages-- and it's a very easy read. I think even tween girls who are reluctant readers won't be intimidated by this book, and I suspect that all types of girls will be drawn to Joey and her story. GOLD MEDAL SUMMER tells the story of Joey a young teen girl who aspires to be a star gymnast. She's never been the best -- that would be her best friend Alex, but she desperately works to get better and better even if it means sacrificing what "normal" teen girls get to do. Not only does Joey feel as if she isn't good enough at the gym, but she also feels that way at home. Joey's sister is now a retired gymnast, but only after achieving National Champion status; and her parents don't even attend her competitions. Like many girls in their early teens, Joey finds that she's facing many drastic changes in her life. Her best friend wants to quit gymnastics, she is attempting some new routines behind her coach's back, and she also finds that she has a major crush on the very cute Tanner. Joey has figure out what her priorities are and decide if she has what it takes to make it as a world-class gymnast. I know I would have loved GOLD MEDAL SUMMER as a young girl. It had the gymnastics angle, friendship issues, family problems, and even a little bit of sweet romance. But I'm pretty sure that Joey was what would have made this book extra-special to me. While I have never been even the slightest bit good at any sport, I could still relate to Joey (and I think all girls will be able to do this!) What tween or teen girl can't relate to the insecurities associated with change? In addition, the issues Joey had with Alex and her family are universal to girls and I think her relationship with Tanner will appeal to them as well. And GOLD MEDAL SUMMER also delves into some mean girl and bullying issues that, unfortunately, will ring true for many readers. What I appreciated as a mother is that not only did the book tackle some of these difficult issues, but it showed how Joey was able to find the self-confidence to handle them. Needless to say, I thought there were some very good messages in this novel! The author, Donna Freitas, was actually a competitive gymnast; and I think her experiences gave another level of credibility to the story. There were numerous references to famous gymnasts as well as routines and moves, and I think she did a great job of making Joey's gymnastic life real to today's girls. I have a friend whose daughter is a competitive gymnast and I can't wait to share this book with her and hear her opinion. I really enjoyed GOLD MEDAL SUMMER. I first thought the book would be a quick read, but the more I read, I realized that it was more complicated. The main character, Joey, has to deal with changes including problems with friends, her family, and boys. The main reason I liked this book is because I could relate to Joey. Joey isn't the best person on her gymnastics team, and she wants to someday win. I am not the best person in my dance class, but I also want to be good and I try hard to be my best. Booking Daughter and I both recommend this to middle grade girls who enjoy realistic fiction. It's the perfect tie-in book to the Summer Olympics! This sounds a bit like a younger version of Bittersweet by Sarah Ockler although it doesn't take place on the Olympic level - just the local championship level. I'm guessing the ending is different, but they seem to explore a lot of the same issues. My book today, Redwoods, is very cute and very informative. I love books that teach me things! Oh, I need to read this one during the Olympics! I'm glad to hear it's so good. I love Booking Daughter's thoughts. I always love your recommendations. And your whole booking family's too. Great review, Booking Daughter! I know that I would have LOVED this book when I was younger too.